The court is no place for a guy with bad knees! For Craig Raucher (username raucher on the BoneSmart forum), playing competitive basketball was always a part of life. But eight years ago at the age of 59, he was definitely in the typical age window for having his knees replaced, especially given his long and rich history with the sport. 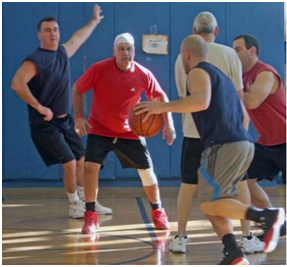 Now, at the age of 67 and with two knee replacements behind him, he’s back playing full-court basketball three times weekly not only with his contemporaries but also with friends who are decades younger. While spending more than 30 successful years in the transportation industry, Craig also pursued his life’s passion – basketball. He’s played organized and college basketball for more than 50 years and is the founder and Commissioner of the Staten Island Basketball League. This well-known organization at Public School 8 in Great Kills, Staten Island began in 1980. It’s the oldest and longest running group at the same location in the history of the New York City school system. Ages of the players range from 40 to 70 and the league is run in a most unique way. The participants are seasoned hoopsters who played in high school or college or in leagues for years. During each three-hour session on Monday and Wednesday nights and Saturday mornings, most of the guys play six full-court games. It is a great workout and a highly competitive experience. In his search for help with his knee pain, Craig sought out surgeons in the New York City area. During those initial consultations, he was told straight out that he would never play competitive full-court basketball again. When he asked why not, the doctors replied they never had a patient with one – let alone two – total knee replacements come back and play full-contact, full-court basketball at the intensity Craig was used to. So even before he started on his knee journey, Craig was told he could not do something that he loved. He silently vowed to write a completely different ending for his recovery. “I listened to what they had to say, but I was determined to get back to playing my sport at a high level regardless of what I was told.” This determination led Craig on a recovery journey that, although not appropriate for everyone, worked very well to get him back in the game. His goal was to defy the odds. Craig’s approach to knee replacement surgery and recovery involved extensive research and some hard work physically to get himself in shape for what was to come. Prior to both surgeries, he spent months in the gym, worked with a therapist and exercised at home to strengthen his leg muscles. He worked primarily on the four quadriceps muscles in the thigh using a treadmill, bands, and weight machines – all under the guidance of his physical therapist. Craig’s total knee replacements were done by different surgeons about two years apart. The first by Dr. Scott Marwin (NYU Langone OrthopedicCenter) was at 59 years old and the second by Dr. David Mayman (Hospital for Special Surgery) at the age of 62. Both surgeries went well, but he had an especially good experience with post-surgery pain management at the Hospital for Special Surgery. One day in the hospital, then he was released and on his way to recovery! For the first 2 weeks Craig worked with a home therapist and had a nurse monitoring his progress. By week 3 he was ready to transfer to outpatient therapy to up the intensity a bit. Formal therapy was done 3 times a week for many weeks and in between sessions he walked slowly on his home treadmill. After several months, Craig made his first appearance at the gym and gradually began to use the machines to build both upper and lower body strength. He incorporated stretching statically, bands and kettlebells into the program as he went along. At each step, Craig was careful to make sure that none of the exercises resulted in significant pain or increased swelling. It was a slow, steady process of increasing strength and agility. Six months after the second knee replacement, the big moment came. Craig was ready to start shooting some hoops. About 9 months after the surgery he resumed playing full court basketball three times a week. He had successfully worked his way up to the grueling 3-hour sessions with men 25 years younger. And much to his joy, he and his knees were holding their own in the games! His aggressive approach to rehabilitation and positive mental attitude combined with his doctor’s surgical skills helped Craig achieve his goal of returning to basketball and the life he loves. He may be unusual in his physical, mental and emotional intensity during rehabilitation from his knee replacements, but playing basketball serves as Craig’s means for maintaining mobility and health as he ages.